Kids Elite Premier S.A.C.C. Training Camp focuses on Speed, Agility, Coordination, and Conditioning, giving young athletes a competitive edge! Led by Kids Elite Sports Camp Founder and Director/Head Coach of St. John’s College HS Track & Cross Country, Coach Desmond Dunham, your child will engage in sophisticated training modalities that Coach D has refined over his 20-year coaching career. Young athletes learn proper running mechanics, increase speed & agility, improve hand-eye coordination, enhance reaction time and explosiveness, and develop quality conditioning and fitness levels. 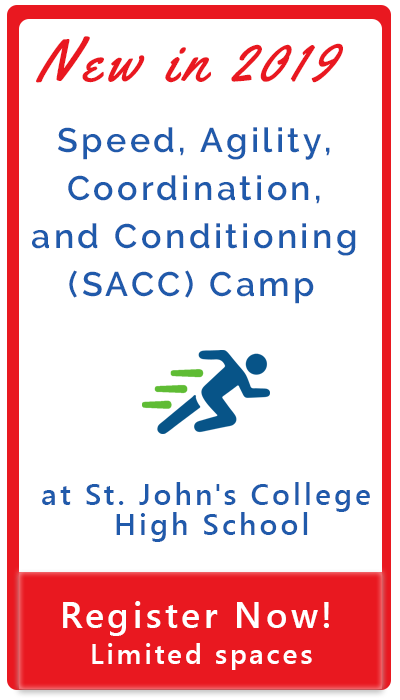 SACC Camp is for dedicated and experienced youth athletes who seek to develop athleticism to excel in their primary sport(s).